Black Hawks, FEMA, and the Red Cross? This was one weird backpacking trip… It was both my sister’s and my partner Nicole’s first backpacking trip ever. The goal was to reach the crystal clear waters of havasu. I had done the trip 3 times prior and was confident in my ability to be the trip leader. After a brief 16 hour drive to the south rim of the Grand Canyon we all crashed in the back of the Jeep and tried to get some sleep. We had spent the last few hours of the trip driving 140 miles in a very remote area through the worst thunderstorm I’ve ever witnessed. The rain was so heavy and the lightning so bright that at times we could only drive 5 mph. Fortunately the storm passed after a few hours and we made the decision to proceed with the trip. 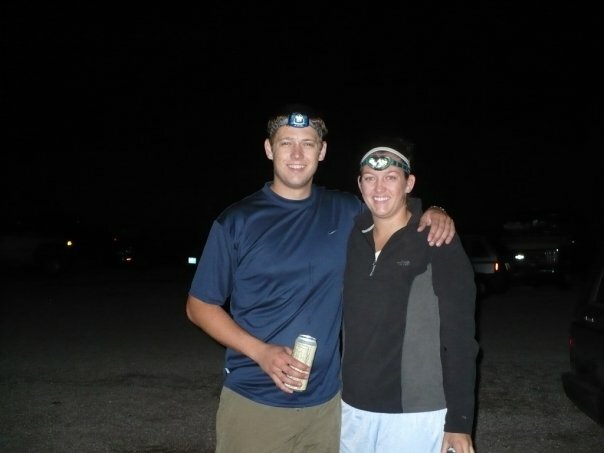 We left the Jeep at 4am and started our 10 mile hike by head lamp down the Grand Canyon to Supai. After six miles of hiking we finally reached what should have been the calm crystal clear 70 degree Havasu creek… it looked more like the Colorado river. It was a dirty fast flowing river that had overflowed its banks by 50 feet! The bridge to cross the creek was inaccessible and was covered with large tree branches. Unbeknownst to us, a few hours prior an earth dam failed and sent an wall of water down the canyon. As we sat at the bank of the river a privately owned helicopter combing the canyon spotted us and landed in a clearing a few yards away. The pilot waived us over and two officers from the Bureau of Indian Affairs (BIA) helped us load our packs into the helicopter. We were told that more water was expected to come down the canyon and we had to get out of there immediately. We were taken the rest of the way to Supai where we mingled with a hundred other campers. We heard story after story of other backpackers that had spent the entire night hugging trees or scrambling up the side of the canyon trying to escape the flood waters. People lost hundreds of dollars of gear including wallets and car keys. To put this into perspective, the amount of water rushing down the canyon was so great that it leveled several homes, completely destroyed one of the waterfalls, and created two new falls in its wake. We were stuck at the village all day (all foot paths in and out of the village had been destroyed). 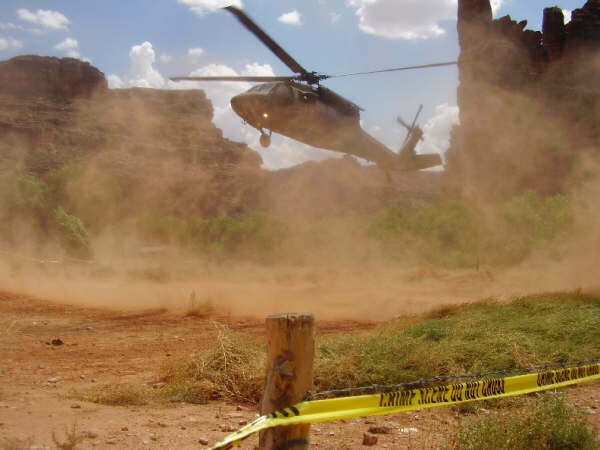 After a few hours the BIA informed us that FEMA helicopters would be joining the rescue efforts and that the US National Guard would be bringing in Black Hawks to evacuate the village… I couldn’t believe this was happening! Eventually the three of us were strapped into a Black Hawk and flown out of the canyon to a Red Cross mobile command center. There we had to sign in and give our story and observations of the situation in an attempt to account for everyone in canyon. We were given a bottle of Gatorade and told to drive 200 miles back off the reservation to the nearest hotel. What a day. p.s. 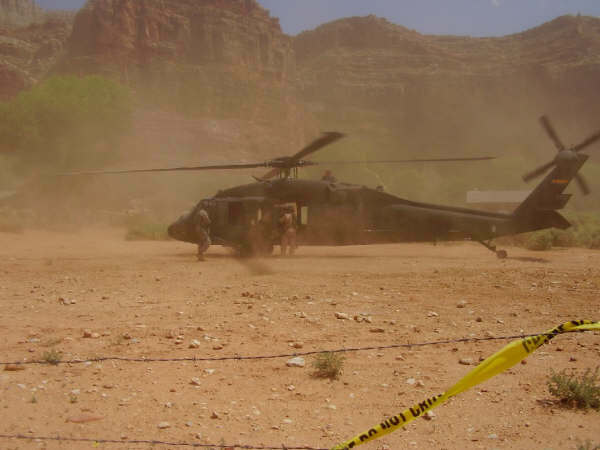 If you’re ever being evacuated by a Black Hawk in a dusty environment don’t take pictures… it will trash your camera. These are the last photos this digital camera ever took. This entry was posted in Nature and tagged Backpacking on August 10, 2008 by cpiekarski.